I definately under-appreciated this document when I first explored the box. I'm not sure I even remember seeing it before at all. It's a guarantee on my great-grandfather, Arthur Milne Lee's, piano! 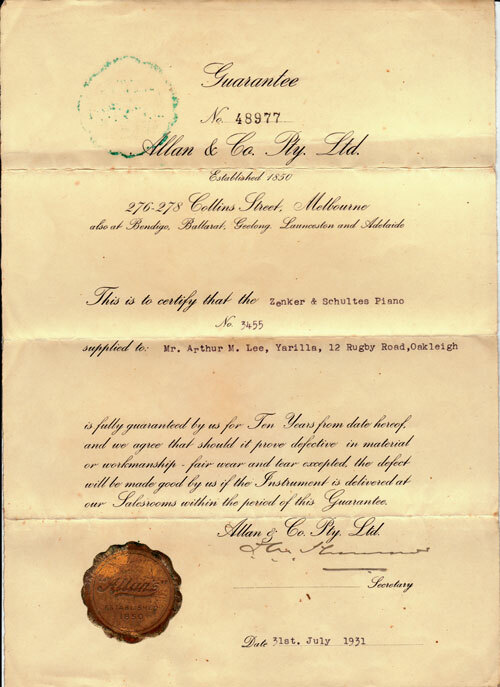 The most obvious thing I learned from re-examination of this document is... they had a piano. The Zenker and Schultes Piano No. 3455, to be precise. Another thing that I noticed is that they called their house in Rugby Road, "Yarilla". This is new information for me. Although I've had access to this document for 20+ years, I haven't entered the house name "Yarilla" in my database until now. via the National Library of Australia Australian Newspaper website, here. It certainly looks like the piano was on sale when they bought it! I wonder whatever became of that piano? Sure, you could grab the images and run, but it would be much nicer if you got in touch. Please contact me at the email address on the about page, or leave a comment! Greta Koehl at Greta's Genealogy Bog asked me how I made the new banner on this blog. Here's what I did, step by step. Let me know if you follow these steps to create something similar! But not too similar, cos this is my look now, OK? It was a bit lightweight for what I had in mind, so I made the text bold. I also wanted more dimension to the text, so I used layer styles to add a bevel to the layer and a thin stroke outline in black. Next I added a pattern adjustment layer and picked a nice woodgrain pattern. I set the layer to 'overlay' and used the text layer as a clipping mask. That made a big difference because it meant that the pattern applied only to the raised bit, not the stroke. I wasn't happy with the colour so added a brown colour fill adjustment layer to the clipping group - again I liked the look of the 'overlay' setting the best. Then a green colour adjustment layer and I used the layer mask to pick out the leaves. I've just upgraded to Photoshop Elements 9 which has layer masks included - woohoo! - but there are plenty of plugins around that add the feature to earlier versions. I've just updated the look of my blog. I used Blogger's template designer and customised it until it was somewhere near what I had in mind. I didn't quite get there, but I think I can live with most of the compromises I made. The only one that really annoys me is the faint border around each image. If someone could tell me how to get rid of that, it would be much appreciated. I've tried to keep the elements I liked and had good feedback on with the previous design - a clean style with the text easily readable (larger, serif font), and not too much clutter. The biggest change is the banner. I'm rather pleased with it, if I do say so myself. 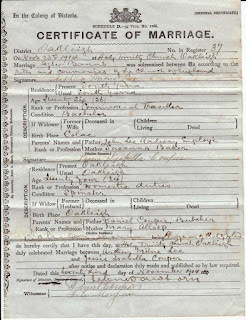 Although I was not experienced in genealogy when I first explored the box, I could definately appreciate the genealogical value of the original marriage certificates inside. 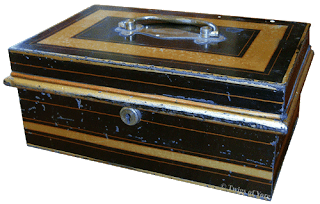 As well as my grandparent's own marriage certificate, the box contained marriage certificates for two sets of my great-grandparents. I'm sure there are plenty of people who wish they could have that sort of head start! Don't worry, information on my other branches was much more sparse! 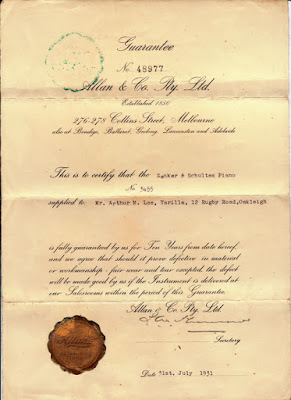 I think that what I didn't appreciate, until now, is the feeling of holding in your own hands an original document that your long-gone ancestors had held before you. Although I love the ability to download digital images of all sorts of things, it's not quite the same as seeing the documents 'in person'. I've scanned these before, but at a time when computer storage space was at a premium. Now that storage is a bit cheaper, I'm rescanning them in colour to try to capture some of the feeling of the originals, for any family members who want to see them. 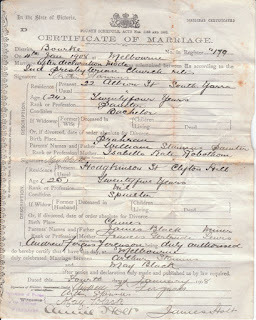 Here is the marriage certificate of Arthur Stannus and May Black, in 1908. And the other for Arthur Milne Lee and Jessie Isabella Couper, a little earlier, in 1904. Are you related to these families? Copyright is a concern when publishing information on the web, or anywhere for that matter. Users of the National Library of Australia's Australian Newspapers website may be interested to know that the Library says "Yes it is OK to do[sic] use the images on Wikipedia and other websites". 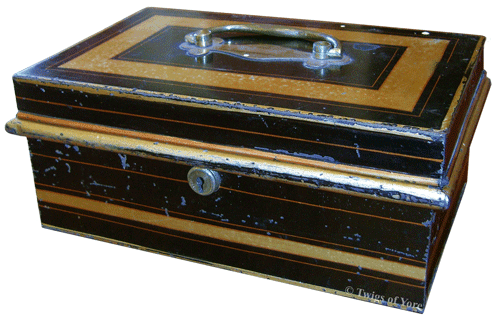 They suggest that the item be sourced with the persistant identifier (a special link to the article located on the left of the page). Pictured above is my treasure chest. A slightly beaten up metal box. I collected it from my Dad's house today and have to take it back once I'm finished with it, lest I'm accused by my siblings of heirloom snatching! My four year old son was very interested in my treasure chest... at first. He was not so impressed when I let him look inside and he discovered that it was "just paper". That's not treasure at all in the eyes of a four year old. This box holds my maternal grandparents' family papers. It contains all sorts of odds and ends relating to the family over the last 100 years. It's been many years since I looked in this box, and I am sure I failed to appreciate the value of at least some of the items inside. I intend to share my finds over coming Thursdays as I rediscover the contents of my treasure chest! Who got me? Ancestry. At long last, I've taken out an annual subscription. I'm now on the UK Heritage Plus package. In the past, when I've wanted to use Ancestry's databases, I've gone to the library or a couple of times a year I've taken what I think of as a 'hit and run' membership... join on a monthly plan, download all I can for a month, then cancel! I'm still catching up on the data entry from an electoral roll download binge in 2007. Over time, the number of collections of use to me has increased until finally, I've succumbed. No more 'hit and run' memberships for me, at least not in the next year. The major draw cards are the (horribly transcribed) UK census collection, the Australian birth, death and marriage indexes (even with the flaws identified by Geniaus), Victoria Australia passenger records (thanks to Rachel for telling me how to access the images), Australian electoral rolls, London Parish Records, and most recently the England and Wales National Probate Calendar. While some of these are available elsewhere online and usually with better transcriptions, they are on pay per view sites, or don't include images. I'm sure that other collections that will be of interest to me when I take my time and have a closer look. Already, I can tell that the way I use Ancestry has changed. I've had a few good finds that I probably wouldn't have made if I was under time pressure to get all the information I could download in a month. Any suggestions as to what, on Ancestry, an Australian whose ancestors mostly arrived from the UK in the 1850s, give or take, should take a closer look at?! Spring has sprung, and the wattle is in bloom. It's starting to look a lot like spring here in Canberra. 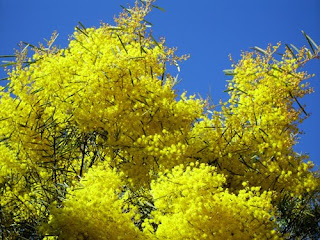 Our back fence is topped by a bright display of wattle from our neighbour's yard. I'm not sure that we are completely clear of winter illnesses, but I'm certainly hoping we are!